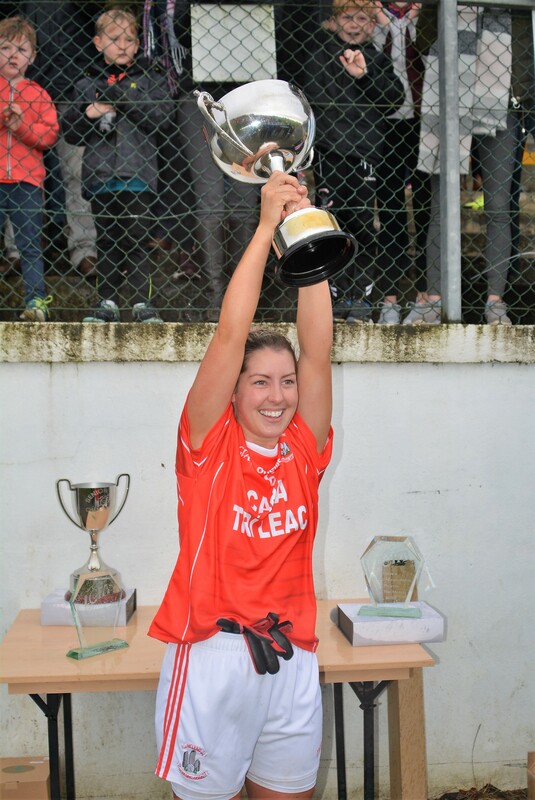 Captain Cathy Donnelly turned in a player of the match performance and helped drive Trillick to the Ulster Junior club title at Killyclpgher on Saturday. Despite being a low scoring game there were loads of chances for both sides. Posts, crossbars and uprights were hit, a penalty was saved and several easy chances were kicked wide. Lavey's case wasn't helped by the red carding of half back Siobhan Jordan with 15 minutes to go. After the first 30 minutes the sides were level at 2 points apiece. Catriona Smith and Alice Clarke scored the Lavey overs while Trillick's scores came from Fiona Owens and Cathleen Kelly. In the second half Rachael Jordan managed a brace for Lavey however the excellent Emma Brennan fired over 3 points for Trillick and Owens added another to give the Tyrone champions a narrow two point win.